This Event is Now Over. Winners list below! Thanks to all the authors and readers who came and had such fun finding romance books! We love you all. All Amazon Gift Cards are for www.Amazon.com. We don't purchase them for different countries. Open worldwide. Void where prohibited. You must be at least 18 to enter. Thank you! Received mine today. Thank you! I received mine and have already bought 2 books. On Mar 14, 2018, angienb said: Thank you! Thank you do much for the giveaway. I received my gift card ..tytyty! On Mar 09, 2018, sgrm said: 3 new favs? The books that I read about in the blurbs of all the authors really caught my eye. I loved that Diana made a book about someone in the position (or somewhat my position). I feel lost and stuck. Hopefully it will be of some comfort. I would love to read stories by the following authors: Susan Squires, Regan Black, and Maya Tyler. I now want to read more from Dani Harper, Maya Tyler and CiCi Cordelia. On Mar 08, 2018, Ravenclaw said: Thank you! First, thank you for the opportunity to do this giveaway! I am so excited..
Yours to Command by Shona Husk! I only found 1 new author who caught my eye: Diana A Hicks. Her book, Love Over Lattes in the Desert Monsoon Series looks good! It's on my TBR list. I'll be looking forward to the future books in this series. Thanks as always for a great hunt Tammie! On Mar 08, 2018, Elle said: New Authors to Check Out! Wow! There are so many my head is spinning! I think I'll just close my eyes, point, and take a chance. I found several new authors. To name three are Rita Herron, Sherry Queen, and Alanna Lucas! Thanks to all the authors that helped make this special! There are so many authors who I want to renew acquaintance with...like Sabrina York (that yummy brogue, lol) or Dani Harper or Caroline Warfield. Thanks for another fun hunt! I have read Sabrina York but it has been awhile so I am going to try her again.. Josi S. Kilpack, Jennifer Faye and Caroline Warfield are new to me but their books sound interesting. 1. Dani Harper's Storm Crossed. I liked the combo of a Fae and his GRIM brother interacting with a single mom and her Asperger son. Since my youngest son has Asperger's I can see where this might get really interesting. Because I like Seals and Ruckus has to work to keep his hands from around her neck and her delectable body. First - did you see the cover? Yum! Second - A vampire and a social worker team up to protect kids. I found a lot of authors and books that caught my interest and will be joining my Kindle in the near future. 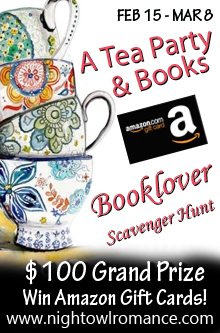 Thanks for new authors to read and enjoy and thank you for this awesome scavenger hunt. I love reading different authors, and all types of romance stories. My favorites would be paranormal, I love shifter, vampire, witch stories. i like Maya Tyler, Regan Black, and Dani Harper. thanks for fun contest Tammie! Books by Dani Harper, Teresa Gabelman and Erica Lynn. The books by Teresa Gabelman, Josi Kilpack and Alanna Lucas. Taryn Jameson, Carmack Cook,and Daniel Harper. I was drawn to Harper Jewel, Ripping of the Mask for m/m my favorite genre. Teresa Gableman, the Protectors Series books looks hot and Erica Lynn, Love & Justice Novellas because I love crime stories with hurt/comfort themes. My pick for 3 authors would be Tory Richards, Gail Hart and Riley Murphy to start with. But I pick Zoe Dawson, Tory Richards and Susan Squires as they are all new to me. I have shared this contest to Facebook at least 10 times.The number of my entries never goes up?I am confused.I know I have brought at least 5 new people. Erica Lynn, Celia Bonaduce and Carmen Cook are a couple of the authors I would like to try. Sheri Queen, Gail Hart, and Diane Benefiel are three of many authors I now want to read. Thanks for introducing so many authors. I would like to read more of: Christina J Michaels, Sabrina York & Caroline Warfield... Thanks! I want to read more of Dani Harper, Jennifer Faye and Sabrina York. I want to read Carmen Cook, Zoe Dawson and Charissa Stastny. Thanks for the chance!! I'm interested in checking out the books by Celia Bonaduce, Riley Murphy, and Diana A. Hicks. On Feb 28, 2018, Lashea said: Loving it. Sabrina Your, Gail Hart and Carmen Cook. Sabrina York, Ruth A Casie, Caroline Warfield. Their books and some other books sound very interesting. Thank you for a fun event. I have learned about new to me authors and their books. I also found books for authors I already read but didn't know about. This has been a lot of fun for me! I know you asked about three books but I found so many more than that so I will list a few. Those are just a few but I have a list of them and more so I can purchase them as I can. Thank you for everything! I can't wait for the next one! On Feb 26, 2018, ArlenaDean said: My three Authors that I want to read! My three authors that I want to read are Maya Tyler, Kara O'Neal and Jessica Jayne. All of these authors have some interesting reads! On Feb 26, 2018, Angieia said: Enjoyed! I am looking forward to reading books by Dani Harper, Camern Cook, Diana A. Hicks, Charissa Stastny, Gail Hart and Maida Malby! On Feb 26, 2018, pixiestyx said: So many new books to choose from! I think my top 3 authors would be Dani Harper, Regan Black, and Joan Carney. There are so many great authors listed! My top 3 are: Taryn Jameson, Zoe Dawson and Teresa Gabelman. I found some new authors I would like to try: Children of the Empire series by Caroline Warfield, SEAL Team Alpha series by Zoe Dawson, Caught by Christina J Michaels, Sapphire Creek series by Carmen Cook. Tory Richards, Dani Harper and Gail Hart. Three new authors I'd love to read are Diana A. Hicks, Charissa Stastny, and Jessica Jayne. I love these contests! Shona Husk, Susan Squires and Dani Harper all look like authors I will be checking out! Thanks for the chance to win and thanks to all of the authors. Dani Harper, Jennifer Faye, and Erica Lynn are a few that have my attention. Taryn Jameson, Alanna Lucas & Joan Carney. On Feb 25, 2018, Sylvie said: New-To-Me Authors! I always find new authors here! This time, I'm especially intrigued by Teresa Gabelman, Harper Jewel and Dani Harper. Thanks! On Feb 25, 2018, socialjsmith said: Three authors. "Tell us about 3 authors who you now want to read." Jennifer Faye, Rita Herron, and Celia Bonaduce all sound quite good! I like the sounds of some books by Rita Herron, Erica Lynn and Zoe Dawson. I just preordered and can not wait for its release. Jennifer Faye-I have read one of hers already, Gail Hart and Josi Kilpack!! I am looking forward to reading books by Celia Bonaduce, Erica Lynn and Gail Hart. Thanks for the tea party! Mm, lots of good books here. I think I'm most interested in Shona Husk, Taryn Jameson and perhaps Susan Squires. But there's a lot of really nice looking paranormal romance here, all these summaries seem cool. I HAVE to read Storm Crossed by Dani Harper. I'm also going to check out Maya Tyler and Alanna Lucas. Paranormal and historical, perfect! I'd love to read Susan Squires, Regan Black, and Dani Harper. Of course, there were others, but those are three I found I've to read. Thanks for once again offering so many great authors and wonderful books. New to me authors are Sabrina York, Carmen Cook, and Sheri Queen. On Feb 22, 2018, esky said: More books!! As usual so many Great New Author for me..
Sheri Queen , Rita Herron , Carole Ann Moleti..
On Feb 21, 2018, ElenaB said: Just 3? So many interesting authors! I would like to read books by Teresa Gabelman, Ruth Casie, and Susan Squires. Thanks for sponsoring this great Tea Party Scavenger Hunt. 3 new ones for me are Rita Herron, Carole Ann Moleti and Sheri Queen..thank s for this Tea Party! On Feb 20, 2018, Diana Ware Page said: Three Authors I’d love to read . Maya Tyler, they are all in my magic and Witcher’s, wereanimal genres that I adore. I'm interested in Sheri Queen, Riley Murphy and Teresa Gabelman. I now want to read Regan Black, Jessica Jayne, Jennifer Faye and Dani Harper. I'm looking forward to reading the books by Rita Herron, Sharon Buchbinder and Dani Harper! On Feb 19, 2018, OwensSumer said: New authors!! 3 new to me authors that I'm super excited about are Alanna Lucas, Gail Hart, Diana Hicks!! The 3 Authors that I haven't read before and would like to now are: Jennifer Faye, Gail Hart, Jessica Jayne. There are other Authors that I would like to read too that were listed in this Book Scavenger Hunt. I found 3 new-to-me authors I'd be interested in reading: Caroline Warfield, Charissa Stastny and Alanna Lucas. Thanks for the fun giveaway! I have so many different authors! Way too many that i want to read and have read already! On Feb 18, 2018, DebraTaylor said: So Many Wonderful Authors ! On Feb 17, 2018, DaniD said: So many great sounding books! On Feb 17, 2018, petuniag said: Thank you! Harper Jewel, Sabrina York and Jennifer Faye. I want to read Riley Murphey, Jennifer Faye and Dani Harper. All sound like authors I want to read.Thanks for the awesome giveaway. The 3 authors I want to know more about are Carole Ann Moleti,Charissa Stastny, and Caroline Warfield. On Feb 16, 2018, Tashia Jennings said: Wow! So many wonderful authors and books! Can't wait to read Brimestone! Love Sabrina York! So many paranormal too. Paranormal romance is my favorite! Sheri Queen, Maya Tyler and Teresa Gabelman. Always looking for new books to read. I made a list according to things I enjoy reading about. Scotsmen (Sabrina York - The Highlander Is All That); Time Travel (Rogan Black - Timeless Light); and Civil War stories (Joan Carney - Fated Memories). On Feb 16, 2018, CandyLyn said: My 3 favs! Sabrina York is also known as Her Royal Hotness and she loves to give away tiaras! Alanna Lucas loves to travel and uses what she experiences in her novels! Jennifer Faye has two cats and has also been nominated for many awards, not to mention the ones she has won! Josi S Kilpack, Regan Black, & Sabrina York. On Feb 16, 2018, Deborah Favorito said: Three new authors to me. On Feb 16, 2018, JAYE said: New Authors, YAY!!!!! I am now interested in reading books by Michelle Arris, Diana Hicks, and Rita Herron. I can't wait. On Feb 16, 2018, Moonbeam said: The Three Authors I want to read now. I would like to read Jennifer Faye, Charissa Stastny, and Sabrina York after reading the blurbs. There are more but these were three of my favorites. I woulld like to read books by Zoe Dawson,Sabrina York and Sharon Buchbinder. Another great scavenger hunt!I have found at least 2 new authors whose books I would like to read.. I am looking forward to reading Taryn Jameson, Carmen Cook and Susan Squires. Love these hunts, always find new authors and new books. Adding Carmen Cook, Shona Husk and Erika Lynn to my want to read list. I'd like to read Dani Harper, Jennifer Faye and Erica Lynn. I would like to read Susan Squires, Gail Hart and Shona Husk. I love these hunts, they are so much fun and I learn something about authors and new books too. I'm looking forward to reading more from Dani Harper, Taryn Jameson and Zoe Dawson, just to name a few. Jennifer Faye has been on my TBR for longer than I care to remember but I still haven't got around to reading her yet (sorry Jennifer). I also like the sound of Sharon Buchbinder & Diane Benefiel. Theresa Gableman, Ruth A Casie, Maya Tyler, Kara O'Neal and Diane Benefiel. It's a pleasure to have you all over to join us for our first of many 2018 booklover scavenger hunts. We've got some awesome authors this time that have such wonderful books to share. I hope many tickle your fancy. We have a little bit of everything from paranormal to contemporary.